To change your password, first go to My Profile by clicking on your name in the upper-right portion of the screen. Then click the gray Edit button on the right side of the page. Scroll down the page and you will see the form for changing your password as shown below. 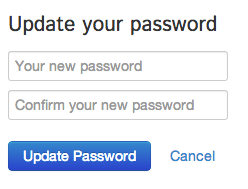 When you are done entering and confirming your new password, click the blue Update Password button to save your changes.